And I Thought I Loved You Then: Hello Gorgeous! Mark and I got a much needed night out, just the two of us. 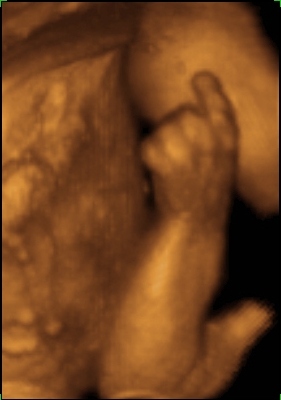 My mom came over to watch Eliza for us and we decided to take advantage of a Facebook Sale our local 4D Ultrasound Studio was having. Terrible bathroom picture but I wanted to snap one for my December Birth Group ladies, we try to share every Friday. We took off early and enjoyed a nice dinner alone. It has been 3-6 months since we have done that! It was nice to eat my whole meal while it was still warm and I didn't have to pick a single crayon up off of the ground! We got to Baby Envision, filled out our paperwork and headed back. I was really nervous. I don't know why but I had a feeling she might have turned out to be a boy. On the paperwork you initial if you want to know the gender. I was ready to initial, star, circle and highlight that section!! The first thing the woman did was heartbeat, sweetest sound in the world! 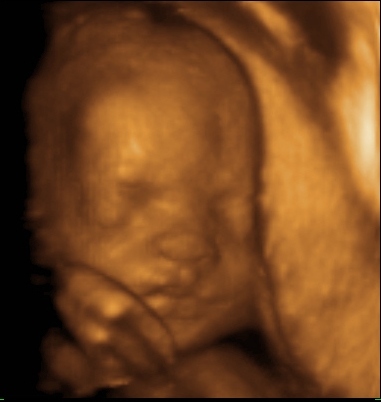 She then went on to say, "OK checking the gender" my stomach fell to my feet...she looks, then looks at us and says "Girl?". What the heck lady? Is that a question?? When I said "I sure hope so" she said "OK good, always makes me nervous when parents already know, I never want to be the one to tell them the opposite!". Lord, that was a tense moment. As she tried to see Emelia's face we realized she is already head down and was facing my back...all we could see was her spine. She giggled and wiggled my belly every which way but it was not helping. I rolled on one side, then the other, but this girl was comfy and not willing to budge. The tech went and got me a juice box in hopes that the sugar would get Emelia moving...seriously, no luck. Then her daddy had an idea, he turned on Pandora from his phone and we placed it on my stomach. She started to dance. He knows her already. She stayed in her head down position, bum up by my ribs and feet to my left hip(no wonder I feel movement all over) but she at least rolled to the side so we could see a bit of her face. She kept her little arm right up there by her face the entire time, at times she even covered her face. We could see her opening her mouth to drink and even a stretch and yawn. I'm not sure if they are similar to Eliza or not. 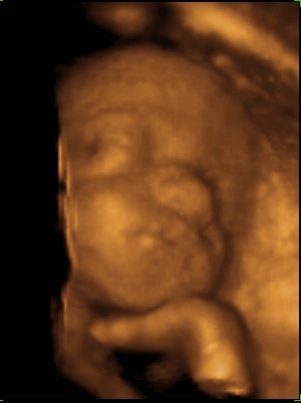 We did the 4d ultrasound with Eliza a few weeks later than this and I don't see much of a resemblance. 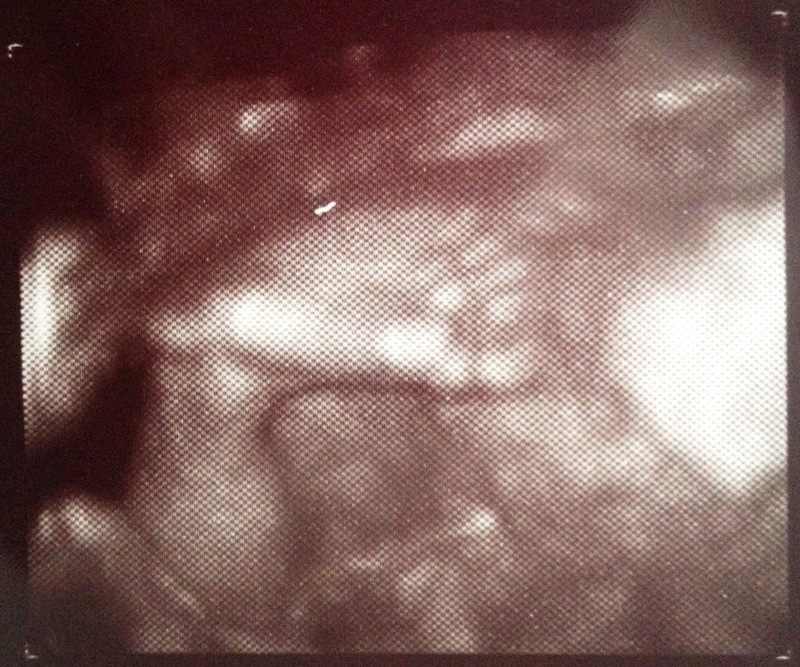 Since she was all tucked in nice and tight we couldn't see a lot, but here are her little foot and hand. It was so great to see and hear her. Always a relaxing experience. When we got home and showed the pictures to Eliza she didn't have much interest. We tried to explain that was Emelia, but no luck. I can't wait until they are older and we can show these to them!